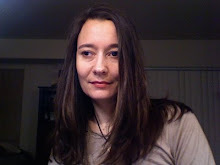 i have not been feeling very well the last few days so have been lying low, lying around, listening to the audio book of prodigal summer as read by the author, barbara kingsolver. 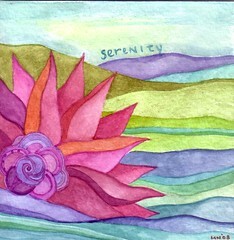 but i did list some watercolor paintings, acrylic paintings, and a beaded button in my etsy shop. i love autumn colors and am inclined to use them all year around, but at least i have an excuse right now! it's good to sometimes do things that you aren't very good at. that you don't have a natural talent for, and that you need to work at. for one thing it builds character. and if you only ever did things you were good at, life would be pretty limiting. but once you get out of school it's easy to not try new things unless you think you'll already be good at them. or to immediately drop anything you try that does not come easily. and, if you are a teacher like i am, it is good to study something you are not gifted at because i think it makes you a better teacher. anyway, this is what i told myself when i studied violin as an adult for.. what was it, 5 years? i still do play occasionally but not as often as i should. and it's what i am telling myself now -- because i am taking tribal belly dancing classes. last night was my 2nd class and i can say i had more fun than the first class, and that i felt less inept than i felt at the 1st class, but this is certainly not something that comes naturally to me. you'd think that as a woman i would know how to shimmy my hips, but apparently not, because i am working at that. and using a few muscles i did not know i had and am pretty sure i have never used for anything in my life. so, to continue my theme on mushroom-art, here we have the most famous mushroom of all - the one that alice made the mistake on nibbling on in alice in wonderland! along with the smoking caterpillar, and peeking out from behind a tree the mad hatter. we're all mad here! click on this photo to be taken to my flickr stream where you can see the whole painting, this merely a detail! some coworkers and i were discussing bartering and all the cool things we have bartered for. i traded web design for chiropractic, a beaded art doll for therapy (!) and art lessons for massage. I've also traded art for art. my coworker M has traded web design for pizza, babysitting for software, and care-giving for rent. K has traded graphic design for massage. What's the coolest thing you ever bardered for? Also, just for the record: I sometimes barter stuff! Maybe you want to trade? 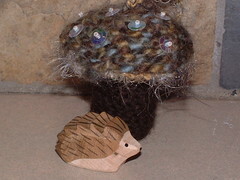 here are a couple cool mushroom projects if you are a knitter. Purl Bee has a mushroom baby rattle that i think i am going to try working up soon since i have hoards of hand painted sock yarn (yet have never - yet - knitted a sock unless you could a wee little stocking ornament! ) also she has a tutorial for making felted mushrooms that are also pretty cool! 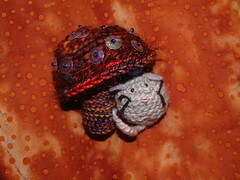 another crocheted mushroom. i used manos del uruguay classic wool for the cap and koigu for the stem. 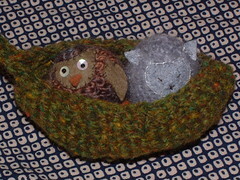 the little mouse huddling under it is made from manos del uruguay silk blend. again i embellished the mushroom with clear iridescent sequins and seed beads. mice gotta keep warm and dry! on with out exploration of mushrooms. you know, they make terribly handy umbrellas for the small "people" of the forest and woodlands. this little mouse is as snug as can be. well, having entertained you with acorn art for the last week or so, i thought it was time to move onto mushrooms. 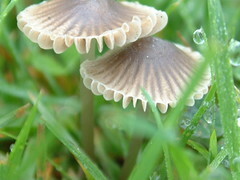 fungus. the darlings of the mycology world. here we have a little toadstool i crocheted out of bits of this and that, embellished with sequins and seed beads. There cunning wee hedgehog is a german import, he's just having a little rest. 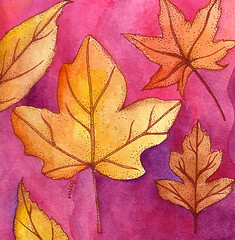 i added some autumny art to my etsy shop today if you are interested! i am almost done with the-week-from-acorn. i just had to post this. 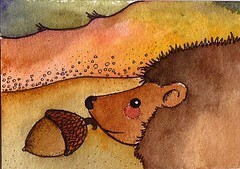 i made this a few years ago.. a tiny painting of a hedgehog with an acorn. it's pen and ink and watercolor! continuing the theme of acorns! 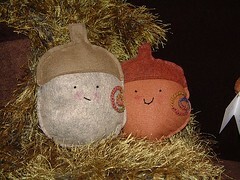 my paper crane has some adorable acorn and pinecone plush on her blog: http://www.mypapercrane.com/. 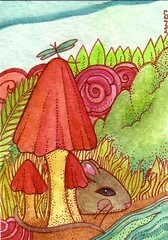 i was thinking i should move on to feature mushroom art next, what do you think of that? i left the feets off but i might still add them. i need to do the ears tighter next time, maybe with a smaller hook so the stuffing does not show through. it's a very cute pattern and easy to follow! in case you do not know who totoro is, he is a character in the animated cartoon "My Neighboor Totoro" by Miyazaki. It's delightful and everyone should watch it! not the best photo but it's really starting to look like a sweater. one sleeve + assembly left to go. 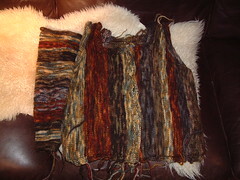 this is sonnet from knitty.com, but instead of garter stitch and box stitch i used stockingette with a seed stitch border. this is manos del uraguay classica wool in prairie, moss, graphite, adobe, and olivewood. more acorns! i made these a few years ago. 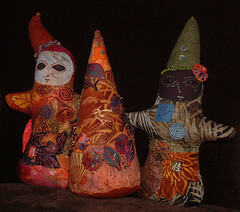 they are made of wool felt with embroidered features and crocheted spirals. they are happy to meet you! this has been the week from acorn! i still have a few acorns left to share with you -- then perhaps i will move on to mushrooms? plus i am working on a very cunning project i will share with you soon.. last night i was crocheting with berroco geode and goodness, it is dreamy. 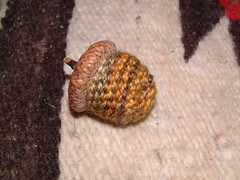 Mandy reminded me that I also made an acorn hat a few years ago! 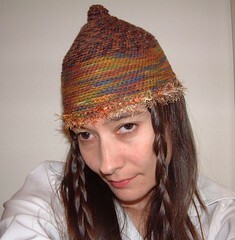 Here it is, being modeled by me :) This is crocheted, using various yarns. 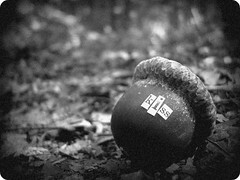 Mandy did something pretty cool with her acorn! and it's a tribute to Peter Pan. Very cool! Does anyone have any other cool acorn ideas? I would love to hear about them! 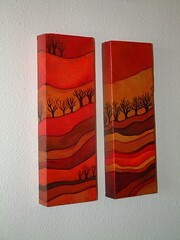 Also, visit Mandy's Etsy shop and see her cool houses! 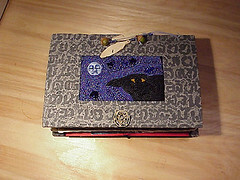 it's a bit hard to see in this photo.. i will have to dig this journal out and take a better photo. my sister asked what i would DO with my acorn beads - well, here are some i made a number of years ago. i used them to decorate the spine of a beaded journal that i had made. this must have been at least 7 years ago, and the camera i used at the time was pretty outdated even then - so i apologize for the quality of the photo! did you ever use a sony mavica digital camera ? they took floppy disks! I made this pattern up.. 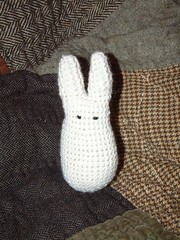 It's a crocheted hattifattener inspired by characters in tove jansson's moomin books. He is 7" tall. Read more about to Moomins here : http://en.wikipedia.org/wiki/Moomin. did you ever think acorns would make cute beads? well they do, but it's a pain to drill the holes and they are likely to crack. however i have a trick. and now is the perfect time to make acorn beads. 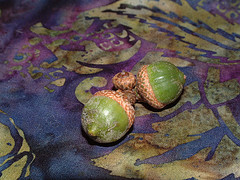 it's about the time here in seattle when the 1st few acorns fall, but they are still green. green acorns are soft and it's easy to poke holes in them without them cracking! and the good news is that they will turn brown over time, if you just let them sit. you'll need some green acorns and large needles. 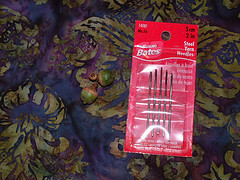 i have some steel needles here that i got at the fabric store. 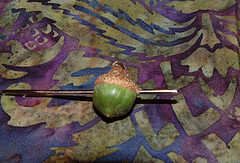 carefully punch a needle through a green acorn and wiggle it around a little to make a hole. ta-da, that is all there is to it! if the cap seems loose or comes off when you put the hole in your acorn, you can re-attach it with a little white glue or wood glue. 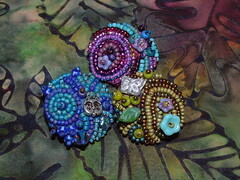 in case you are interested, i just listed four of my beaded buttons (3 shown here + one other) on etsy. i woke up too early and have been lying here thinking about dolls. 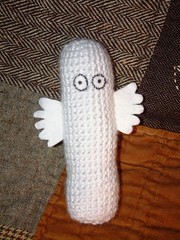 i think it might be time for me to make some more dolls. here we have autumn imp, a tree, and forest imp. i think i need to make some imps, maybe some monsters and witches since halloween is coming. what do you think? i was sick for a few days this week and i am back at work, so i have not done too much art.. but i did get some more beading done on my beaded house. i added the ceramic scarab, among other things. 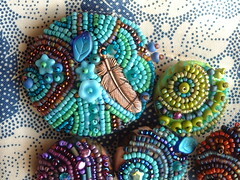 beads and beyond had a scheduling conflict and they rescheduled my button class.. it is now sunday oct 4th! 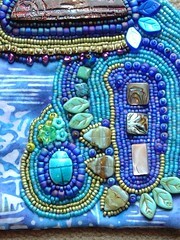 Quiltworks / Beads and Beyond website.